One of the biggest issues to impact seniors today actually isn’t a health issue at all, it is isolation. Many seniors who are home-ridden or are receiving in home care deal with isolation issues and may, as a result, be at a greater risk of developing depression. Even seniors who have in-home caregivers or who are living with family members are at risk for social isolation, as they lack the ability to get out in the world and interact with their peers. As a family member or caregiver of a senior loved one, the more you can do to help combat issues with isolation, the better. Whether you use a car service for seniors, or make sure that family and friends are pitching in to help provide transportation, the more you can do to help your senior get out of the house the better. When seniors lose their ability to drive, it highly increases their chances for becoming lonely or isolated, so they need to feel like they can easily access transportation services without being a hassle. Whether it is a pet, even something as simple as a goldfish, or a plant, when seniors have something to care for, it gives them a higher feeling of purpose and can help prevent loneliness. Seniors who are capable of caring for dogs or cats will often have a better feeling of companionship and feel less isolated, even if they are living alone. Many times, seniors struggle with loneliness and isolation because it is difficult for them to go out in public. Perhaps it is because they are no longer able to drive, or because they struggle with mobility. If this is the case, make sure to plan weekly events inside their home. It can be a dinner, a craft or just playing games or cards. No matter, what it may be, make this a weekly tradition for your loved one. You may not always be able to get your senior loved one up and out of their home, but you may be able to help them feel more connected to the world around them, simply through the internet. It is common for seniors who only interact with the same select groups of people to feel lonely and isolated in their homes. This can be especially true for gay and lesbian seniors who may not have other peers to spend time with. Turn to online resources specifically meant for older gay and lesbian adults, such as gaylifeafter40.com. 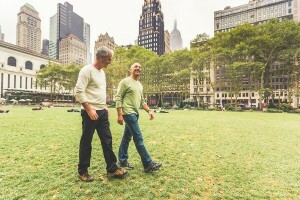 When seniors are able to read articles and view resources about other gay and lesbian seniors, it can help them feel more connected to the outside world. Whether you have a gay or straight senior in your life, the more blogs, articles, videos and resources they can access that specifically cater to their needs and their lifestyle, the better. Senior isolation is a serious problem for older adults of all ages, genders, races and backgrounds, no matter what their sexual orientation may be. As a caregiver or loved one of a senior, the more you can do to help them feel connected to the world as they age in place, the better. ‹ Holidays in Retirement Centers: A Season of Loneliness or Happiness? LGBT seniors should not be neglected in the first place. Many people may react or treat them differently which is inappropriate on any level. Thanks for sharing this blog, I hope it reaches out to several families who are unaware if their senior loved one is socially isolated or has a deteriorating health.